Chocolate Caramel Pie – Yes, it’s as decadent as it sounds! 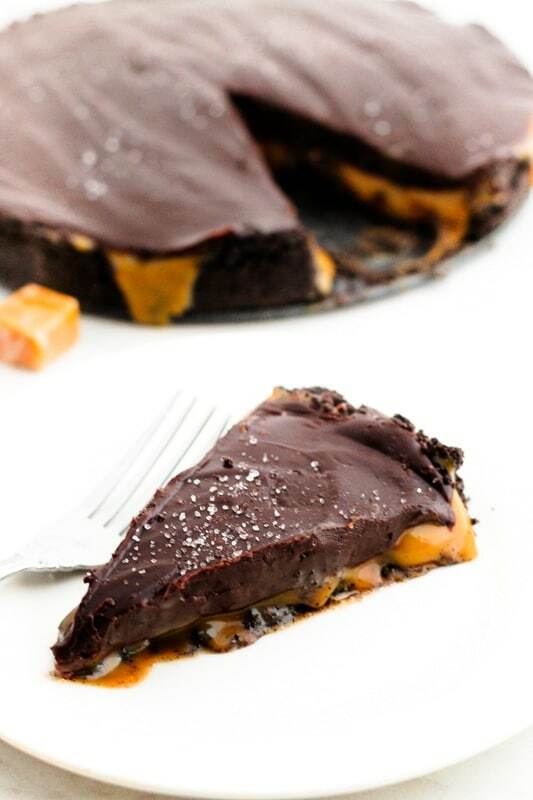 Impress your family and friends with this no bake dessert that’s loaded with chocolate ganache and salted caramel layered in an Oreo cookie crust. This Chocolate Caramel Pie is ideal for Valentine’s Day, but don’t limit yourself to making it only one day a year! 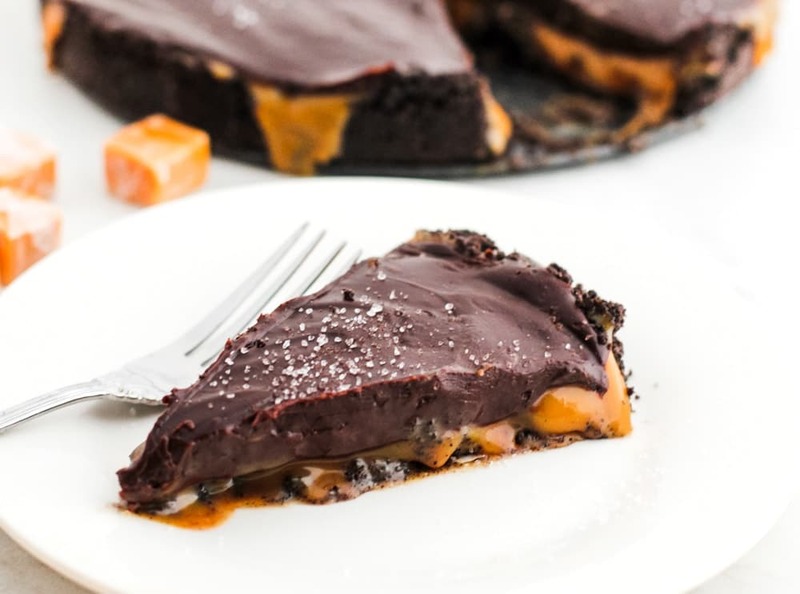 As much as this chocolate salted caramel pie is for special occasions, it’s so easy to make that you can enjoy it whenever chocolate cravings hit. Still, this recipe is great to have on hand when you want a showstopping dessert! 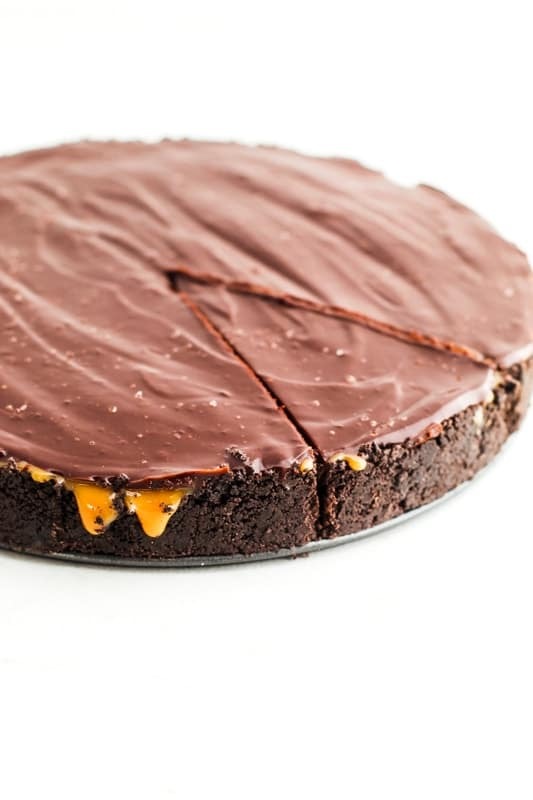 Do you want to know the best thing about this chocolate caramel pie recipe? 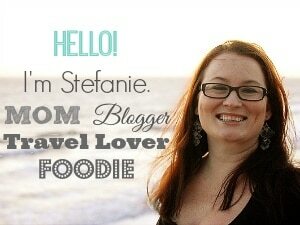 It’s no bake! I can headly believe it myself, but this indulgent chocolate salted caramel pie can be made without turning on the oven, and as a bonus, there are just a handful of ingredients. No bake desserts are as good as it gets when you’re short on time. This chocolate caramel pie has gourmet written all over it, but the secret to one of the most popular no bake pies is Oreo cookies. 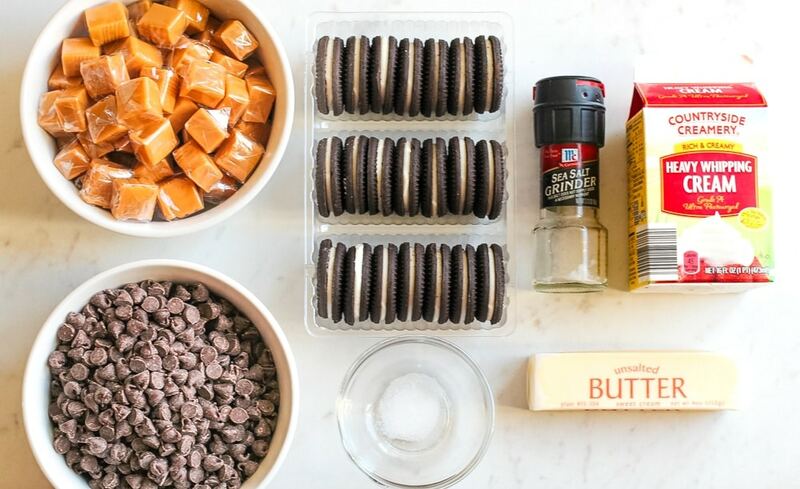 By using Oreos, or similar chocolate sandwich cookies, you can create an Oreo crust that’s practically irresistible. Once you’ve got the Oreo crust, all you need is caramel and chocolate ganache to fill out the chocolate caramel pie. I know it sounds complicated, but this no bake pie takes only 15 minutes to prepare. The rest of the time is spent in the refrigerator chilling! 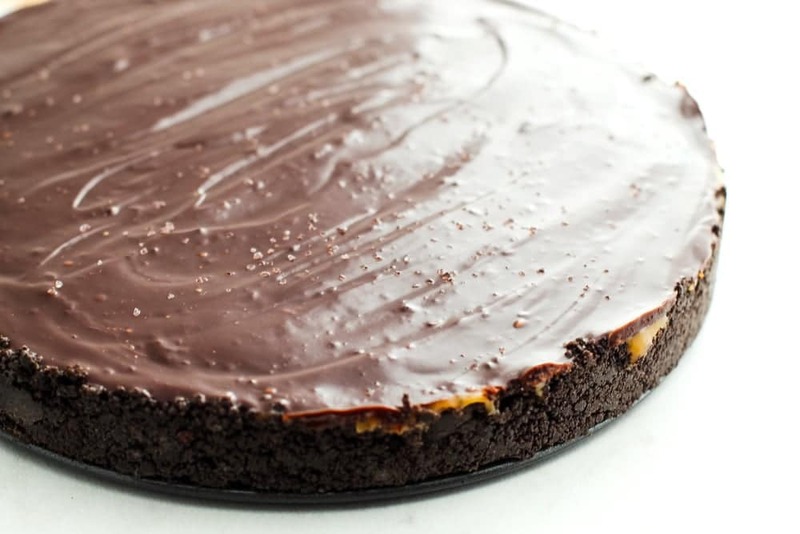 Salted caramel + chocolate ganache + Oreo cookie crust = one no bake dessert that I can get behind! 1. Spray the inside of a 9” springform pan with cooking spray and set aside. 2. Place the chocolate sandwich cookies in a food processor and pulse until they are broken down into coarse crumbs. 3. 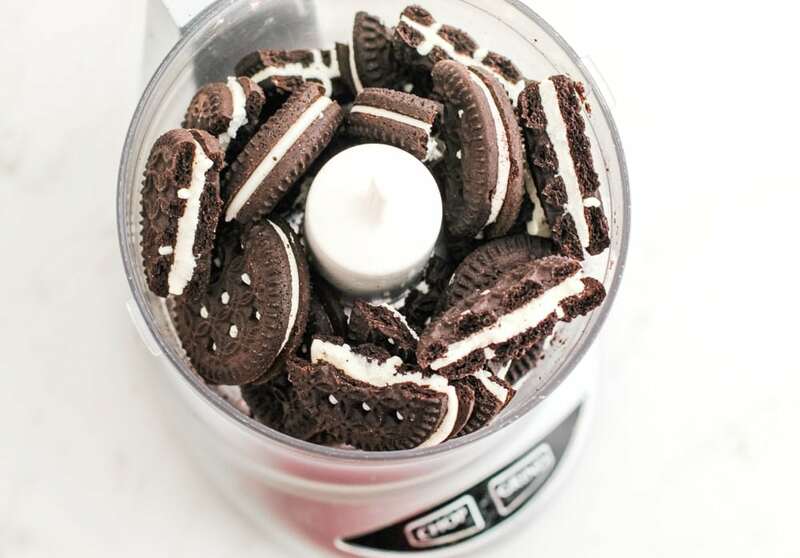 Melt butter in the microwave and pour into the food processor with the Oreo cookie crumbs. Pulse a few times or until the butter is blended into the mixture evenly. 4. Pour the cookie crumb mixture into the springform pan and press gently until the crumbs evenly coat the bottom and approximately 1” up the sides of the pan. Set aside. 5. 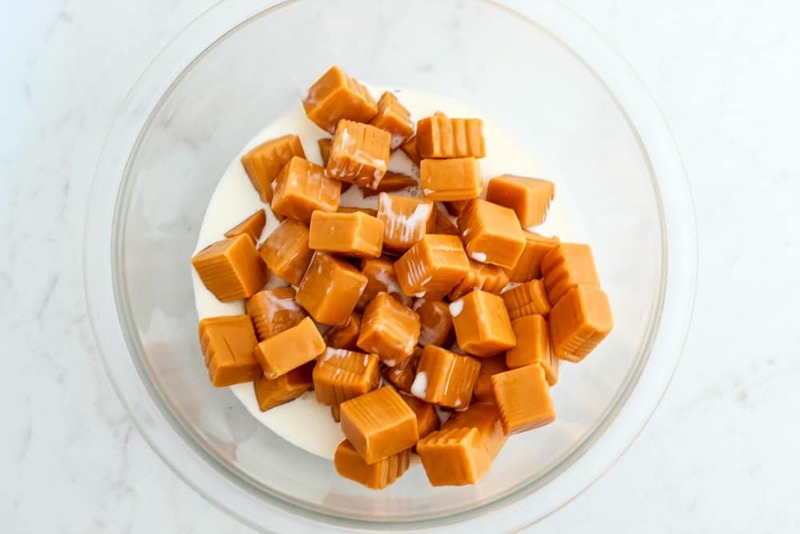 Place the 60 unwrapped caramel squares and ½ cup heavy whipping cream in a microwave-safe bowl. Microwave on high for 2-3 minutes, stirring every 30 seconds and continuing until completely melted. Stir in salt. 6. Pour the melted caramel into the prepared pie crust. 7. Create the top chocolate layer by placing chocolate chips and 1 cup heavy whipping cream in a microwave-safe bowl. Microwave on high for 1 minute, stir and then continue microwaving in 15-second increments, stirring in-between, until completely melted. 8. Carefully pour and spread the chocolate layer on top of the caramel layer. 9. Immediately sprinkle the top with coarse sea salt and place in the fridge to chill for a minimum of 2 hours. 10. Serve chilled. Store in the refrigerator for up to 4 days. Mouthwatering, right? I like pairing a slice of Chocolate Caramel Pie with a tall glass of milk. No Bake Desserts don’t get much better than this! Spray the inside of a 9” springform pan with cooking spray and set aside. Place the chocolate sandwich cookies in a food processor and pulse until they are broken down into coarse crumbs. 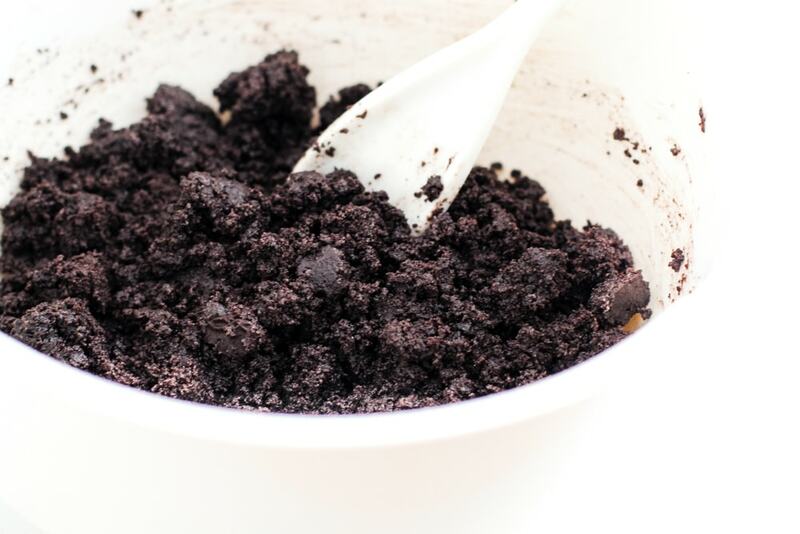 Melt butter in the microwave and pour into the food processor with the Oreo cookie crumbs. Pulse a few times or until the butter is blended into the mixture evenly. 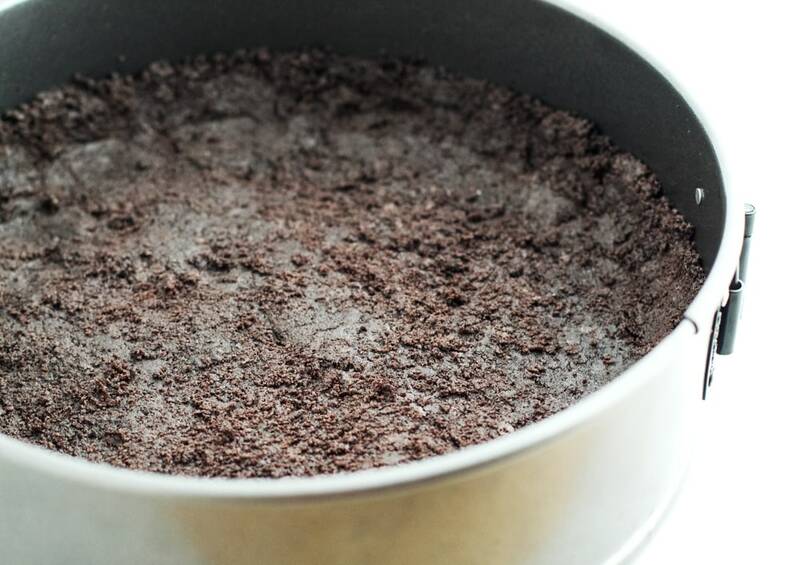 Pour the cookie crumb mixture into the springform pan and press gently until the crumbs evenly coat the bottom and approximately 1” up the sides of the pan. Set aside. Place the 60 unwrapped caramel squares and ½ cup heavy whipping cream in a microwave-safe bowl. Microwave on high for 2-3 minutes, stirring every 30 seconds and continuing until completely melted. Stir in salt. 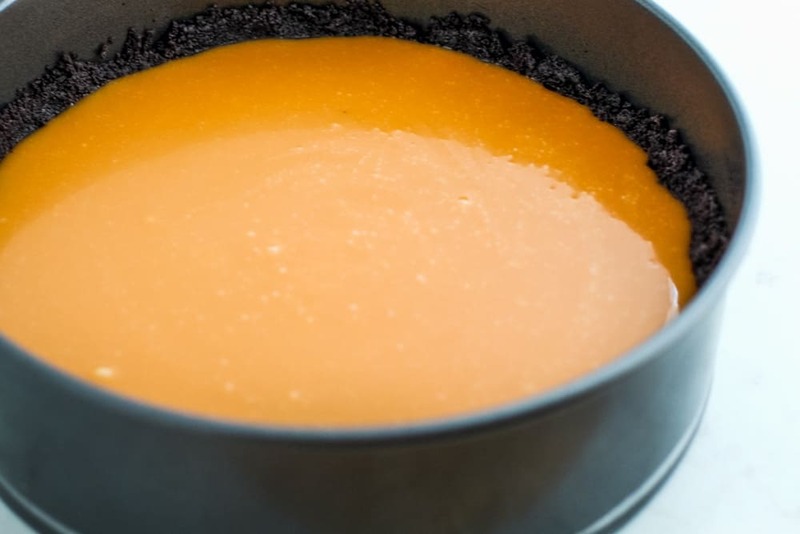 Pour the melted caramel into the prepared pie crust. 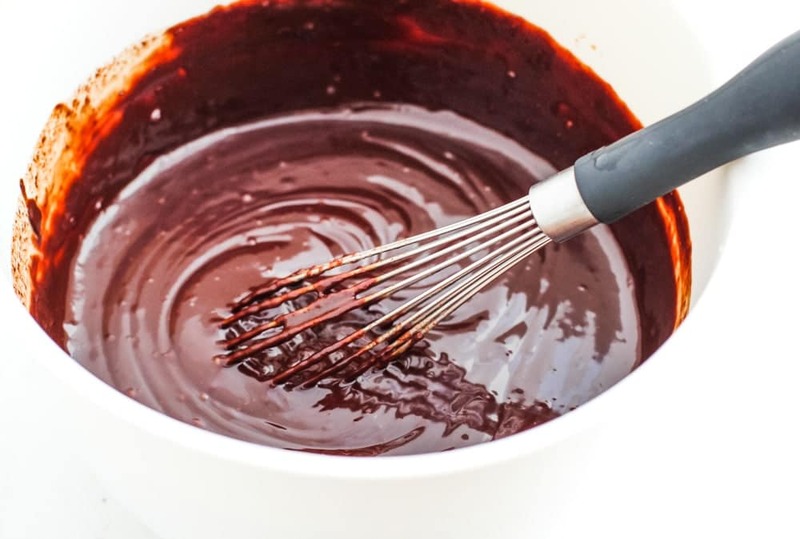 Create the top chocolate layer by placing chocolate chips and 1 cup heavy whipping cream in a microwave-safe bowl. Microwave on high for 1 minute, stir and then continue microwaving in 15-second increments, stirring in-between, until completely melted. 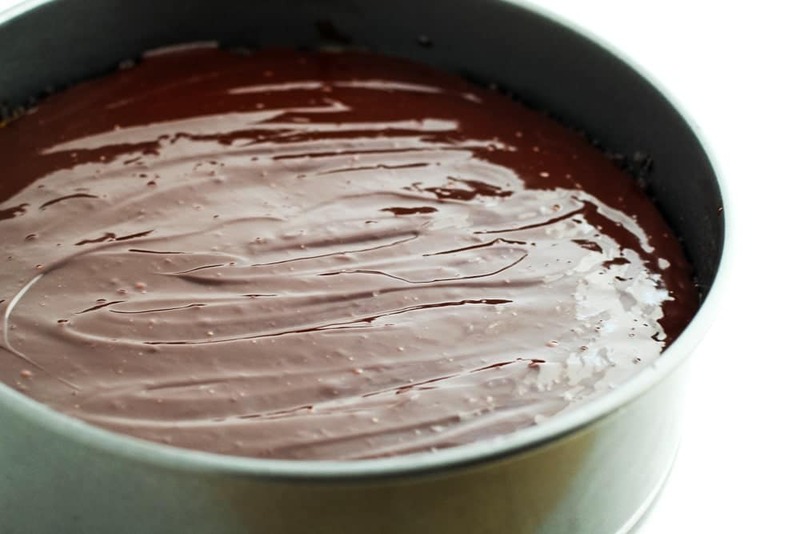 Carefully pour and spread the chocolate layer on top of the caramel layer. Immediately sprinkle the top with coarse sea salt and place in the fridge to chill for a minimum of 2 hours. Serve chilled. Store in the refrigerator for up to 4 days. This Chocolate Caramel Pie recipe is supporting Cookies for Kids’ Cancer Valentine’s event— an annual blogger event, now in its third year, helping to raise money for the nonprofit organization, Cookies for Kids’ Cancer. Did you know that cancer is the #1 cause of death of children by disease in the U.S.? There are 40,000 U.S. children actively battling cancer right now. With less than 4% of the National Cancer Institute’s budget going to all childhood cancer combined, I felt that it was essential to get involved. 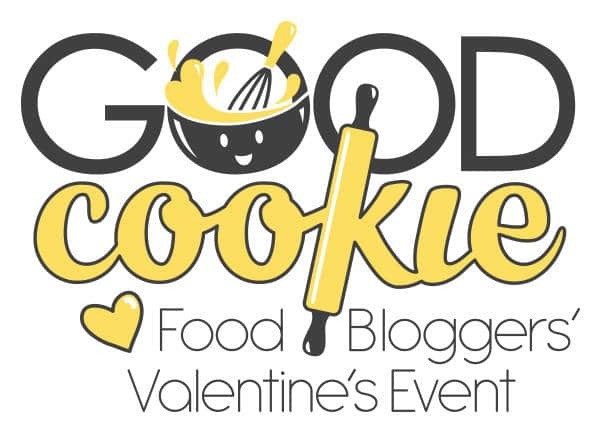 Help make a difference by donating to Cookies for Kids’ Cancer! Our goal is to raise at least $3000. Because these three companies: Dixie Crystals, Mediavine and OXO have each pledged to match our donations raised through this campaign up to $3000!